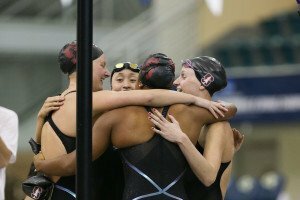 Stanford enters the 2016 NCAA Championships as the defending champions in the 400 freestyle relay and the top seed with a 3:11.44. 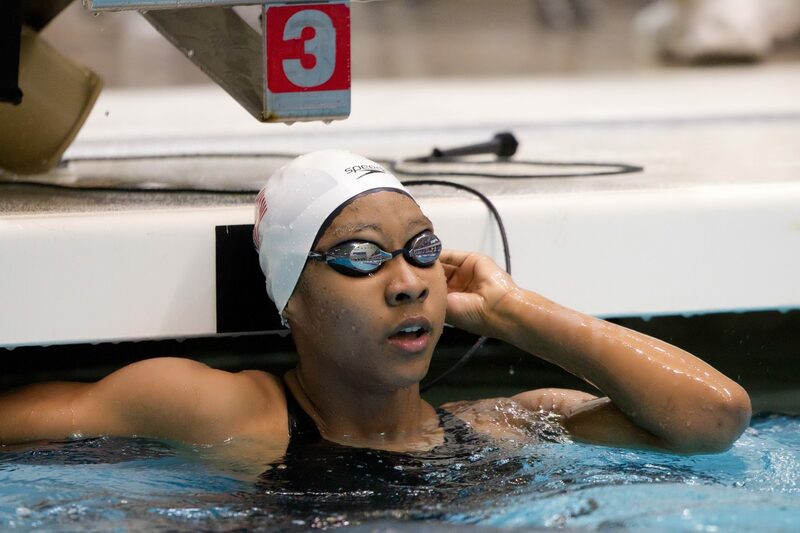 They’re without Simone Manuel this year, but they’ll return Lia Neal, Janet Hu, and Lindsey Engel. Hu and Neal have been on form this season, giving the Cardinal a good chance at a repeat. Hu flat started a 47.9 on this relay at Pac-12s, which matched her 47.9 from last season that she swam with a relay start. Neal is currently the topped ranked 100 freestyler in the nation with a 46.97. Engel is an option for Stanford, but she wasn’t used on this relay at Pac-12s. 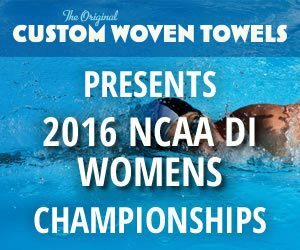 This season, the Cardinal put in Ally Howe and freshman Ella Eastin. Eastin split a 47.97, making a strong case that she should be on this relay at NCAAs. Howe was a respectable 48.62, but they may swap her out for Engel, who split a 47.9 on the winning relay last year. Among the teams who could stop the Cardinal from repeating as champions in this event is Cal. While Stanford is without Manuel this season, Cal is without Missy Franklin, but the Golden Bears are still loaded with talent and head into NCAAs as the 4th seed. They have the 2nd fastest 100 freestyler in the NCAA this year in Farida Osman, who posted a 47.20 to finish behind Neal at Pac-12s. Osman and Rachel Bootsma return to this relay after Cal finished 2nd in the event last year. Bootsma threw down a 47.39 split on that relay. At Pac-12s, Cal had freshman Amy Bilquist lead off the relay, where she swam a solid 48.02. They also put in Kristen Vredeveld, who split a 48.31. Bilquist will likely stay on this relay, but there’s the question of whether Cal will keep Vredeveld on it or use Kathleen Baker. Baker showed promise at Pac-12s, splitting a 47.91 on the B relay. A third Pac-12 team, USC, is also in the running for the event title. 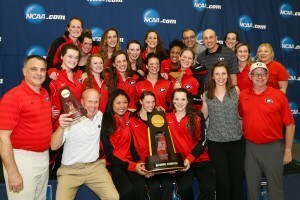 Last season, they were 18th at NCAAs, and missed out on scoring. The lone returner from that relay is Chelsea Chenault. She’s helped USC to a 3:11.87 this season that earned them 2nd seed headed into NCAAs. Last season, Chenault churned out a 47.98 split at Pac-12s. She’ll need to dip under 48 again at NCAAs. Aside from Chenault, the Trojans have an all new relay this season. 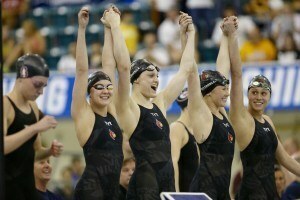 At Pac-12s, that relay included Katarzyna Wilk, freshman Kirsten Vose, and SDSU transfer Anika Apostalon. Both Wilk and Apostalon have been impressive in the 100 free. They were 47.61 and 47.77 respectively at Pac-12s. Vose split a fast 47.9 at that meet, and will need to match that or do even better at her first NCAAs to give this team a chance to win. It’s no surprise that NC State is in position to challenge these teams, given their wealth of success this season. The Wolfpack enters the meet as 3rd seed with a 3:11.90, and will bring back all 4 members of their 5th place relay from last season. 3 of those women, Alexia Zevnik, Riki Bonnema, and Natalie Labonge, swam the winning relay at ACCs. Zevnik flat started a 47.95 to get them going, while Bonemma and Labonge split 47.91 and 48.19 respectively to contribute to that win. 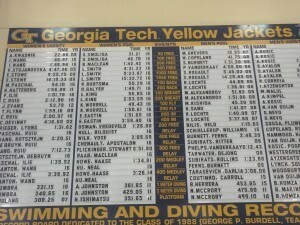 Krista Duffield, who swam this relay last year, wasn’t on that ACC relay. Instead, NC State used freshman Courtney Caldwell. Caldwell had the fastest split on the relay with her 47.85, so they will likely stick with using her on their finals relay at NCAAs. It is possible, though, that Duffield will join her. Duffield anchored in a 48.12 last season, a touch faster than Labonge’s time from ACCs. 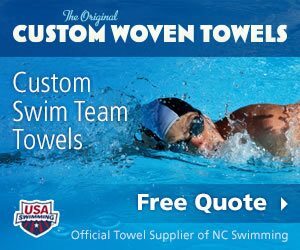 They could go either way as far as who they put on that relay at NCAAs, with the possibility of putting them both on the prelims relay to see who has the faster split. Darkhorse: The Arizona Wildcats have a young team, with 3 of the 4 members of their 400 free relay at Pac-12s being underclassmen. If freshmen Katrina Konopka and Annie Ochitwa are on form, the Wildcats can vie for a top 8 finish. There’s also the possibility that the Wildcats may use Bonnie Brandon. While Brandon hasn’t matched her freshman year success at NCAAs, she has split 47-mid to 47-high on this relay at NCAAs each of the last two seasons. If she can match that, she would give the Wildcats a big boost from their seed.